Zhang Ruimin said he was encouraged by the report of Hu Jintao, general secretary of the Central Committee of the Communist Party of China, at the 17th Party congress. As the CEO of Haier, China's top home appliance maker, Zhang is upbeat about the general secretary's mention of creating world-famous Chinese brands and supporting Chinese companies to go global. 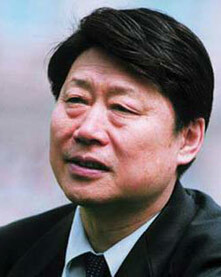 Zhang is an alternate member of the 17th CPC Central Committee. "China should encourage the formation of internationally competitive conglomerates," Hu said at the opening of the congress on October 15. "I think more concrete policies will come out to support Chinese companies' global drive," Zhang said on the sidelines of the congress in Beijing. In a country where Original Equipment Manufacturers (OEM) make up a significant portion of exports, Zhang said he believes working for foreign companies should not be a long-term strategy. The well-known entrepreneur expounded on his understanding of Hu's view on economic globalization. After reading bestsellers such as The World is Flat by Thomas L. Friedman and Protestant Ethics and Capitalist Spirit by Marx Weber, Zhang believes that with increasing globalization, "there will be only two types of firms in every industry in the future: Enterprises with global brands, and those working for them". Zhang added that the non-global enterprises would only just be able to make ends meet. "Haier must develop itself into a world-famous brand," he firmly declared. The company has established 15 industrial complexes, 30 overseas production factories and bases, eight design centers and more than 58,000 sales agents worldwide, according to its website. The Haier Refrigerator Manufacturing Center, set up in the US in early 1999, is Haier's largest production base in the overseas market and the largest Chinese-invested company in the US. One of the key elements for making a global brand is innovation, Zhang noted, repeating Hu's words that improving China's innovative capacity is key to the country's development strategy. Describing Hu's call as "really timely and important", Zhang said his company should make innovations in two fields in particular: technology and management. The Qingdao-based firm has invested 5 percent of its sales in research and development in the past few years.